Has Indiana changed much since 1979? I ask because I just watched Breaking Away, a 1979 nominee for best picture. Breaking Away was shot on location in Bloomington, Indiana and on the campus of Indiana University. And though the film doesn’t go out of its way to idealize either the state, the town, or the university –in fact, the title refers to the desire of several characters to break away from their life in Bloomington — it still manages to make Indiana look like the nicest place on Earth. Add to that, Indiana University is home to the Eskenazi Museum of Art, which I will someday visit. Breaking Away is actually a film about a lot of things: it’s a comedy, it’s a quasi-love story, it’s bittersweet coming-of-age story, it’s a sports film, and it’s a sweet, good-natured film that made me cry. At the heart of the film is Dave Stoller (Dennis Christopher), who has just graduated from high school and whose cheerful and eccentric exterior hides the fact that he appears to have no real future. Dave is obsessed with bicycle racing and idolizes that the Italian cycling team. In fact, he idolizes them so much that he decides to be Italian. He rides around Bloomington, greeting people with a merry “Ciao!” At home, he listens to opera and renames the family cat “Fellini.” While his mother (Barbara Barrie) is understanding, his father (Paul Dooley) cannot understand what’s happening to his son. Of course, Dave doesn’t truly believe that he’s Italian. He just desperately wants to be something other than who he is. And who is Dave? He’s a citizen of Bloomington, a town that is divided between the upper class students at Indiana University and the blue-collar townies. The students call Dave and his friends “cutters,” because the only real industry in town is working in the quarry, cutting stone. The students look down on the cutters and the cutters resent the students. When Dave meets a student named Katherine (Robyn Douglass), he pretends to be an Italian exchange student and, soon, he’s serenading her on the lawn of her sorority house. That doesn’t make Katherine’s boyfriend, Rod (Hart Bochner), happy. Rod and his friends beat up Cyril, which leads to another fight at a bowling alley. (Cyril, for his part, gets his finger stuck in a bowling ball.) Seeking to broker some sort of peace and understanding between the students and the town, the university president (played by John Ryan, who was the real-life President of Indiana University at the time) announces that the cutters will be invited to take part in the annual Little 500 bicycle race at Indiana University. And you can probably guess how the race turns out. It’s a feel-good sports film so you already know who is going to win and that he’s going to have to win after initially falling behind and sacrificing a big lead. You know all that but it doesn’t matter. Breaking Away is such a sweet and well-acted movie that it still brought tears to my eyes even if the ending didn’t surprise me. And really, the film does have a few surprises. For one thing, Rod turns out to be not as bad a guy as you initially think he’s going to be. Over the course of the film, he gets two small reaction shots, both of which hint that he’s not as much of a jerk as he often appears to be. It’s a minor detail and it’s easy to miss but what’s important that it’s there and it’s one of the many small details that makes Breaking Away feel alive. After watching the movie, I feel like I could go to Bloomington and still find all these character hanging out at the quarry. There’s another scene that I want to mention. This is the scene that made me cry. Dave and his father walk around the university and his dad talks about how he and the fathers of all of Dave’s friends helped to cut the stone that was used to build campus. His dad admits that, even though he helped to build it, he’s never felt comfortable on the campus and then tells his son that he doesn’t have to be a cutter. And it’s such a heartfelt scene and so beautifully performed by Paul Dooley and Dennis Christopher that I started to cry. Perfectly acted, perfectly directed, and perfectly written, what a great scene! Fantastico!, as Dave might say. I loved Breaking Away and I bet you would to. 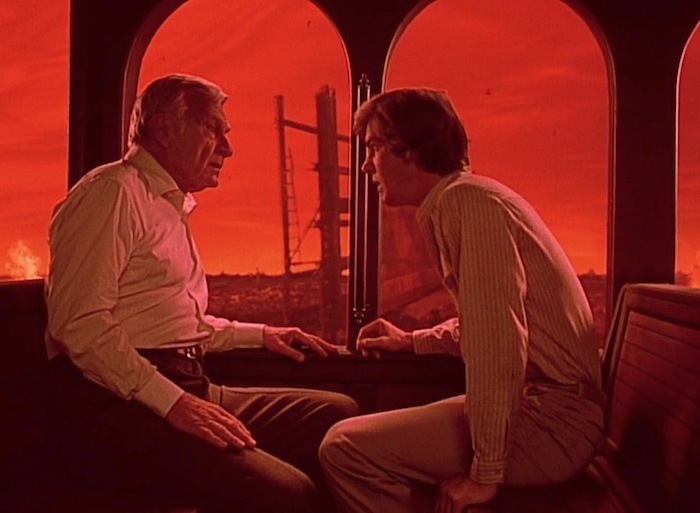 Before there was Inception, there was Dreamscape! Dreamscape opens with the image of a woman running down a street while a red mushroom sprouts above the city behind her. Just as a radioactive cloud envelopes the woman, the scene cuts to a man named John (Eddie Albert) waking up with a scream. John is the President of the United States and he has been having reoccurring nightmares about nuclear war. The dreams have shaken him to the extent that he plans of signing a disarmament treaty with the Soviet Union. Bob Blair (Christopher Plummer, playing one of the slick villain roles that dominated his career until he finally won an Oscar for Beginners) is a political reactionary who works for a shadowy agency that is even feared by the CIA. 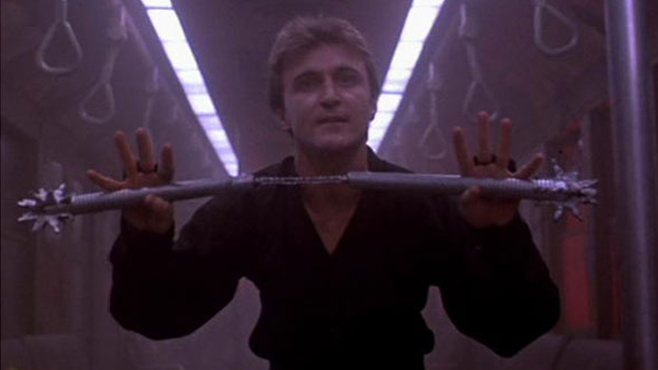 Determined to stop the President from signing that treaty, Blair recruits psychotic martial arts enthusiast Tommy Ray Glatman (David Patrick Kelly, of “Warriors, come out to play…” fame) to assassinate the President. Tommy is a psychic who can enter people’s dreams and when you die in a dream, you die in real life. Tommy is a part of a government-funded research project that is headed by Dr. Peter Novotny (Max Von Sydow) and Beth DeVries (Kate Capshaw). Tommy was the program’s superstar until the arrival of Alex Gardner (Dennis Quaid). Until he was recruited by Dr. Novotny, Alex was using his psychic abilities for gambling and womanizing. Now, Alex has to use his abilities to save the President’s life. Dreamscape came out the same year as Wes Craven’s Nightmare on Elm Street and they do share a few things in common. During one scene set in the President’s nightmare, Tommy even has razor-sharp claws. But ultimately, Nightmare and Dreamscape are two very different films. Whereas Nightmare was a horror film, Dreamscape is an adventure film with horror elements. In fact, Dreamscape feels like four different films all mashed together. 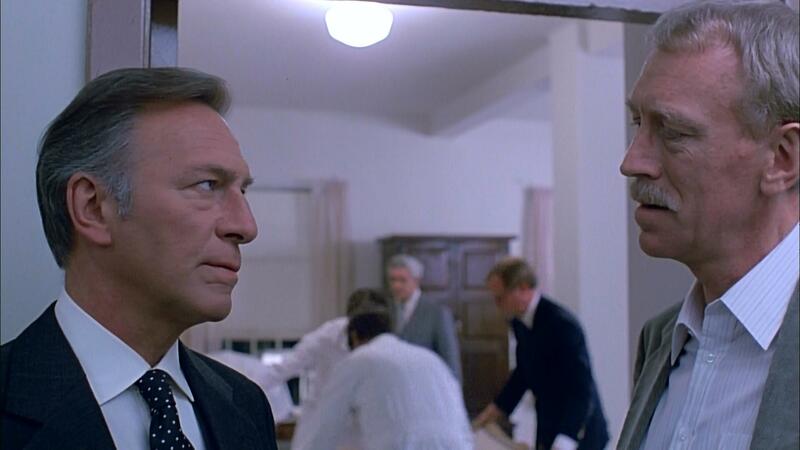 It’s a political conspiracy story, with Christopher Plummer plotting to kill the President. It’s an adventure story, with Dennis Quaid as an appealing rogue. It’s a love story, as Alex and Beth fall in love while researching dreams. At times, it is also a very dark comedy, like when Alex enters the dream of a man who is terrified that his wife is cheating on him with everyone that they know. Fans of cult cinema will appreciate that Dreamscape features one of David Patrick Kelly’s best villainous performances. In the role of Tommy, he not only gets to do his usual bravura work as a weasley psychopath but he also gets to bust out an impressive impersonation of Bruce Lee as well. 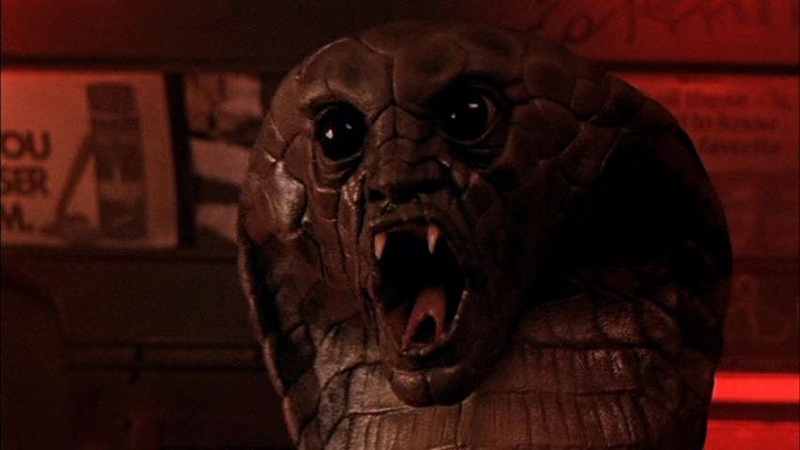 Along with David Patrick Kelly at his demented best, Dreamscape also features the Snakeman, a claymation monster who may look cheesy today but probably gave many youngsters nightmares back in 1984. Like the Snakeman, all of the film’s special effects have aged but it does not detract from the film. Since the special effects were used to create the film’s dreams, it doesn’t matter that they no longer look 100% realistic. Dreams are supposed to be strange so the cheesiness of some of the special effects actually works to Dreamscape‘s advantage. 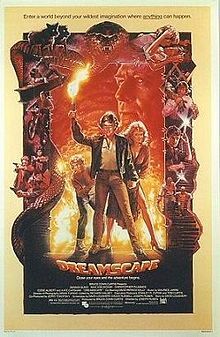 Dreamscape may not be as well-known as Inception or Nightmare on Elm Street but it is still a fun and entertaining excursion into the dream world.